A man has been shot dead in a clash between police and supporters of ousted Honduran President Manuel Zelaya. 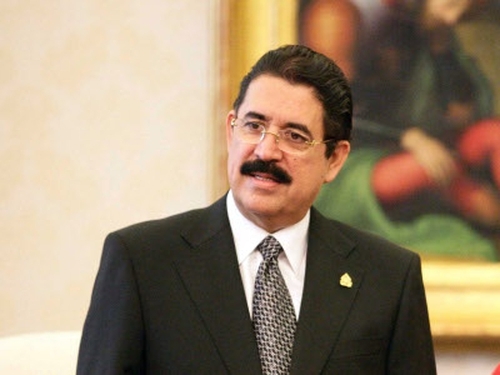 It was the first reported death in political violence since Mr Zelaya, who was forced into exile by a 28 June coup, arrived back to Honduras on Monday and sought refuge in the Brazilian embassy. The man, a Zelaya supporter aged 65, was killed in the Flor del Campo district of the capital. Hundreds of soldiers and riot police have surrounded the Brazilian embassy where Mr Zelaya is sheltering with his family and a group of about 40 supporters. Brazil and Venezuela called at the United Nations for Mr Zelaya, who took office in 2006, to be returned to power. A US official said the de facto government in Honduras signalled it was willing to allow a visit by an Organization of American States mission to try to resolve the crisis, but the pro-coup rulers have insisted they will not allow Mr Zelaya back to power. Several hundred troops and police, some firing tear gas, cleared away pro-Zelaya demonstrators from around the embassy yesterday, injuring 30 people. The government that has ruled Honduras since Mr Zelaya's overthrow relaxed a curfew that had been in effect day and night since Monday, allowing Hondurans to buy food. De facto leader Roberto Micheletti said Mr Zelaya could stay in the embassy ‘for five to ten years’ if he wanted. Electricity and water was briefly cut to the embassy yesterday but food was sent in, witnesses said. The US, the EU and the Organization of American States have urged dialogue to bring Mr Zelaya back to office.